The buzz is growing around Wednesday’s launch of the BlackBerry Z10, Research in Motion‘s next-generation smartphone featuring its new BlackBerry 10 OS, and representing a perhaps final opportunity to turn the fortunes of the struggling Waterloo, Ont.-based smartphone giant around. The online buzz has been growing for weeks, and it got a big boost Monday from influential U.S. gadget blog Gizmodo, which declared the device hotter than Apple’s iPhone, the device that has figured in much of RIM’s recent misfortune. I’ve always hated BlackBerry phones. Disgracefully ugly bricks they were-until the BlackBerry Z10. The BlackBerry Z10 is hot. Truly beautiful, elegant hardware. 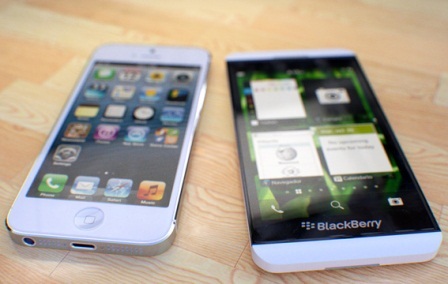 Comparing Apple’s iPhone and RIM’s Z10. If RIM is to begin a turnaround with the Z10, online buzz will be important. And it looks like they’re off to a strong start. Many more photos at the link below.